If your business is in early-stage growth, we know things feel overwhelming. You are not alone! Join Center for Women & Enterprise VT for the 4th cohort of women-owned businesses preparing for the next stage of development. In this intensive 13-week strategic growth planning course, participants gain knowledge, skills, resources, and networks to explore new markets and overcome barriers to growth, followed by ongoing support. 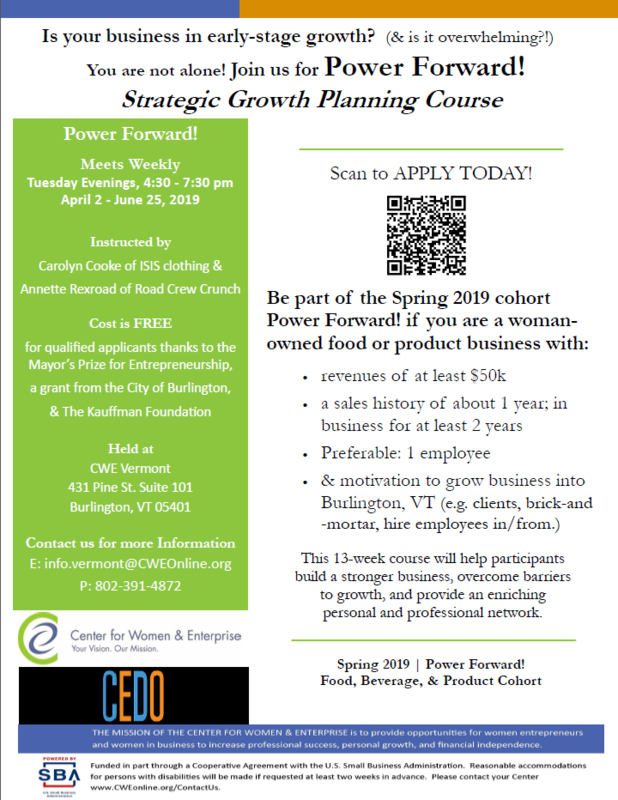 Women-owned food and product businesses with revenue of at least $50,000 and are in pursuit of expanding in and around the Burlington area, such as creating jobs, generating increased revenue, or taking on more contracts, are invited to apply for Power Forward! This program is provided at no-cost to accepted participants through CWE VT and a generous grant from the Mayor’s Prize for Entrepreneurship, a partnership between the City of Burlington and the Ewing Marion Kauffman Foundation. How to know if your business is the right fit? Apply today! Be in touch! Email info.vermont@cweonline.org; or call 802-391-4872.